Tomb Raider was a hot comic book and movie series, and the movies featured Angelina Jolie. This makes it easy to see why Tomb Raider Secret of the Sword is such a popular slot machine. Not only does it feature Tomb Raider characters, but it also offers great animation and some excellent games and bonus opportunities that make spinning the reals even more exciting. Devised by Microgaming, this game offers multiple icons that feature the legendary main character, Laura Croft. When you start playing Tomb Raider Secret of the Sword, the main objective is to start finding pieces of the lost sword, which are essential to bonus payouts. When playing in standard play, using the multiple paylines offered will increase the chances that you win. 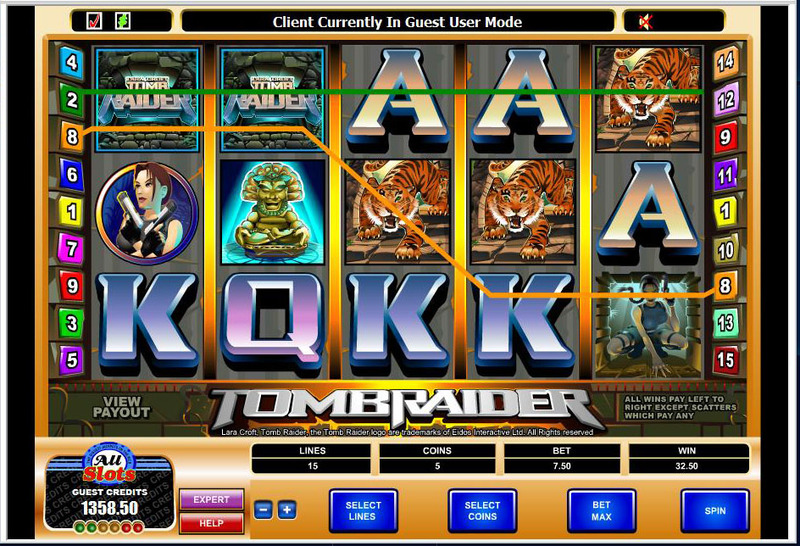 Both a scatter and a wild are featured in the game, and players can also enjoy the exciting bonus games that go along with the Tomb Raider and Laura Croft theme. The great part about the special games is that you’ll have plenty of fun while having a great chance of scoring a great win. The scatters in the game are Excalibur symbols, and when you get three or more of them, you’ll get to enjoy the Free Bonus Spins game. To get into the Global Adventure Bonus Game, which can really pay off, the Passport symbols are very important. You’ll also enjoy the random bonus opportunities, which give you special wilds that stay active while you’re playing. When you weigh the pros and cons of the Tomb Raider Secret of the Sword slot game, you’ll find that the pros far outweigh the cons. One of the cool benefits is enjoying the animation offered in the game, and just playing a game that features Laura Croft is exciting. The random bonus opportunities that show up in Super Mode are also very beneficial, giving you greater chances of winning. One of the hottest features is the Global Adventure Bonus Game, which really lets you get in on the Tomb Raider action. Of course, there are a couple cons to keep in mind. After spending some time playing the machine, you may find the sound effects a bit irritating. Some players find that the bonus games are a little confusing as well. Tomb Raider Secret of the Sword offers five reels and 30 paylines. The minimum coin size is $0.01, and the maximum coin size is $0.02. The max bet is $300. With the low minimum, you have the opportunity to have a lot of fun playing the game without needing to have a huge amount of money. Even with the low coin sizes, the jackpots are actually pretty good. The reason that this slot game is so much fun is because of all the extra features and cool games that break up the routine spinning of the reels. The Free Spins Bonus Game allows you to make more money because consecutive wins are rewarded up to 5x multipliers. If you keep hitting consecutive wins, you can win big here. Another great game is the Global Adventure Bonus Game, which lets you virtually travel the world to several different locations. You want to find the sword fragments while playing the game, and you definitely want to avoid the traps. If you end up finding all of the sword fragments, you’ll get a special jackpot. You can also accumulate bonuses during the game. With so many different features and games, you won’t get bored playing Tomb Raider Secret of the Sword. Fans of Tomb Raider will enjoy spinning the reels of this game, and the low minimum bet offers you plenty of fun, even if you don’t have a lot to spend on the machine.